2. Once you have logged in you will need to click on the drop-down menu near your account name in the upper- right corner. Please select "Profile" in the drop down menu. 3. Once the Profile page comes up you will see a menu banner along the middle of the page. Please click on the API option. 4. On this page select all the bubbles you see filled in below. 5. It is recommended to add the list of Coinigy IPs as your trusted IPs for the API key. You will find these IPs in the same location as where you input the API key and secret. 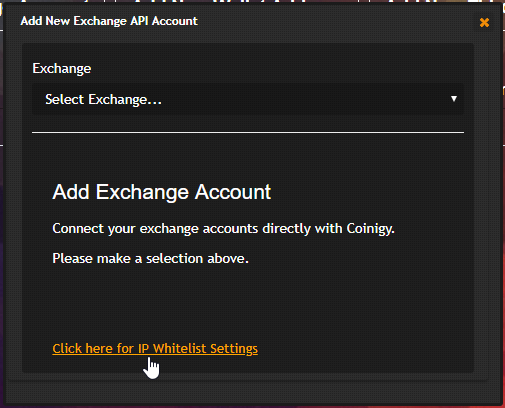 Click on the IP white list settings on Coinigy and input the list displayed. Separated with commas and has no spaces (including at the end). You do not need to include your personal IP. 7. Press "Activate" on the new key and accept the confirmation email you will receive. Your CEX API key is now created and is ready to be added to Coinigy.